Anna Paolina Hasslacher is an internationally active Mexican pianist of French descent. She develops her musical activity as a soloist, a chamber musician and in various free improvisation projects. Anna Paolina studied piano with Claudio Herrera, Laurent Cabasso and Michel Gaechter. Since her general musical studies she was attracted to innovative sonorities and instrumental techniques, and she decided to specialize in contemporary music, obtaining two Specialization Diplomas: in Piano and Chamber music (contemporary repertoire), in 2010 and 2012 at the Strasbourg Conservatory, France. Later she continued her training at the Music Academy of the University of Basel, Switzerland, obtaining a Master’s Degree in Performance of Free Improvisation in 2016 under the tuition of Alfred Zimmerlin and Fred Frith. She has premiered important works, such as I. Fedele’s Études Boréales, H. Lachenmann’s Serynade, both in Mexico, and H. Quintanar’s Sonidos in France. 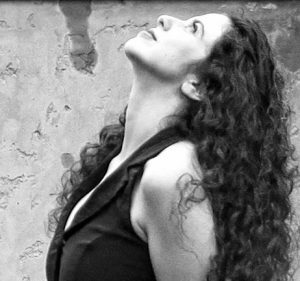 As a soloist, Anna Paolina has been conducted by Jack Fortner and Juan Trigos, both renowned composers as well as conductors, and she has played in many International Festivals: in France at the MUSICA Festival in Strasbourg, and in Mexico at the Cervantino International Festival in Guanajuato, the FIAC (International Contemporary Art Festival) in León and the Ecos y Sonidos International Festival in Guanajuato, where she performed the Guanajuato premiere of Alfred Schnittke’s Concerto for piano and string orchestra, for the commemoration of the 60th anniversary of the Guanajuato University Symphonic Orchestra. In 2008 she cofounded CEGAC (Composers and Performers of Guanajuato A.C.), a Mexican association mainly aimed at the dissemination of contemporary music, the promotion of cultural heritage, as well as the exchange between artists. And in 2009 she founded with the flutist Olivia Abreu Ensemble Vertebræ, chamber music ensemble with variable instrumentation, dedicated to premiering and furthering contemporary innovative repertoire. In the domain of improvisation, Anna Paolina is particularly interested in the exploration of sound and its metamorphoses through the use of extended and unconventional piano techniques. Since 2013 she is involved in various free improvisation projects, such as “… So klang, so far…” and “Modulations of Feelings”, a musical and philosophical project in which she collaborated closely with her brother, the neurosurgeon Juan Francisco Hasslacher. Pedagogy is an integral part of Anna Paolina’s musical field of action, which is why she has developed international projects with Ensemble Vertebræ to present workshops and lectures in conservatories and music schools, as well as didactic concerts for children and young people. In 2016 Anna Paolina obtained the prestigious Music Teacher State Diploma in France. Anna Paolina performs in different countries, mainly in France, Mexico, Switzerland and the United States.